Photographs and information courtesy of Geoffrey Dennish. Born: 17th July 1891, Bethnal Green, Middlesex. Baptised: 29th November 1895, St. John’s, Bethnal Green. – same day as his sister Esther. Parents Emily & James Dennish a Boot Maker. Died: 31st December 1916, at 61, Woodlands Park Road, Tottenham, Middlesex; age 25. Served 2 years & 33 days. His mother Emily Alice Dennish (of 6, St. Stephen’s Lane, Ipswich) was present at the time of death. Occupation at time of death – Barman. 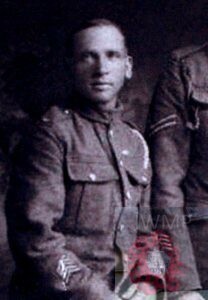 Enlistment Details: Location: Folkstone, Kent: Age: 18 years & 1 month; Occupation: Barman at The Windmill; Date: 14th August 1914. Next of Kin: James & Emily Dennish, of 6, St. Stephen’s Lane, Ipswich. Height: 5ft 8 1/2ins. light complexion, grey eyes & light brown hair. 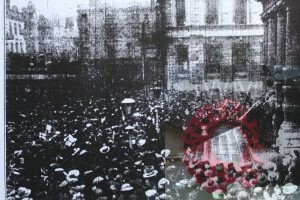 Service: Woolwich – 14th August – 18th May 1915. France 19th May 1915 – 12th March 1916 – Embarked for England on H.S. ‘Panama’. England 13th June 1916 – 15th September 1916. Offence: 15th February 1916 – not complying with an order – in the field. 3 days F.P. Admitted to field hospital 3rd March 1916. 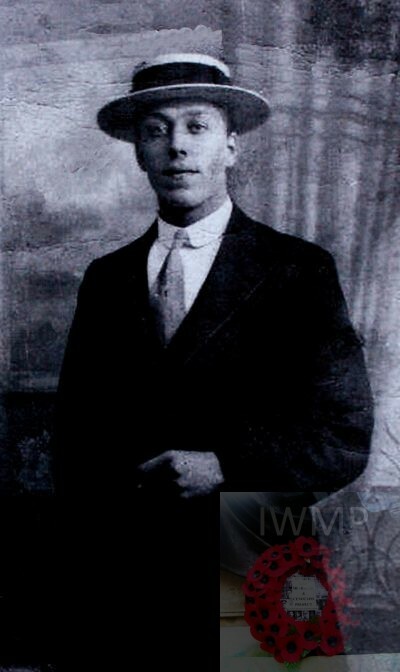 Discharged – 15th September 1916 – age 25 years & 2 months – Physically Unfit – Cardiac Valvular Disease – Permanent – not a result of, but aggravated by active service. Character – Very Good. Address: 61, Woodlands Park Road, Haringey. Regiment: Royal Field Artillery, 5 ‘C’ Reserve Brigade. Medals Awarded: Victory, British War & 1915 Star + silver War Badge issued 20th December 1916. 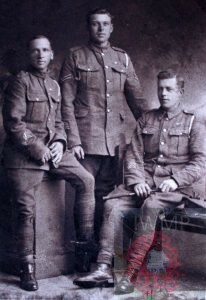 Edmund far left.Royal Field Artillery uniform. 1901 18, Dorkin Street, Ipswich. James Charles Dennish, 33, a Boot Maker, born Stoke Street, Ipswich. Emily Alice Dennish (nee Moore), 32, born Ipswich. James Dennish, 14, an Iron Turner, born Ipswich. Ellen Dennish, 12, born Ipswich. Esther Dennish, 6, Bethnal Green. Emily Dennish, 4, born Bethnal Green. Alice Dennish, 1, born Ipswich. 1911 The Windmill, High Street, Acton, Middlesex. Edmund was 19 years old, a Bar Keeper for Licensed Victualler, Mary Ann Capon. Grace Ethel Dennish, born 26th March 1915, Edmonton. Eric Edmund Dennish, born 19th June 1917, Edmonton. Soldiers’ Effects to Ethel M. Dennish – widow. Edmund’s father James Charles Dennish, born Stoke Street, Ipswich, on the 3rd August 1867, was the son of James Dennish & Ellen Holmes. He trained as a boot-maker in Ipswich. 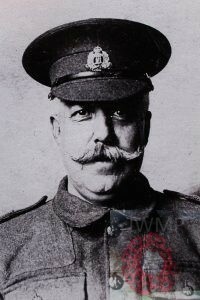 In 1904, James was one of four short-listed for appointment to the post of Sergeant of Mace for the Borough of Ipswich. 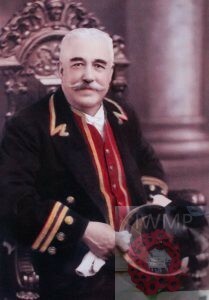 At a Special Meeting of the Estates Committee on the 6th December 1904, James was appointed Sergeant of Mace. His duties commenced on the 2nd January 1905. The Dennish family lived throughout his time in office at 6, St. Stephen’s Lane, Ipswich. James held the position of Sergeant of Mace until he suffered a stroke, at the age of 66 years, in 1934, and died two weeks later. Shortly after James’s death, his widow Emily moved with their unmarried daughter, Katie (believed to be the first woman police officer appointed to the Borough Force), to Christchurch Street, Ipswich. A Town Sergeant (Sergeant at Mace) supports the Mayor in his roll, and carries out ceremonial duties for the Borough of Ipswich, including the Remembrance Sunday Parade. 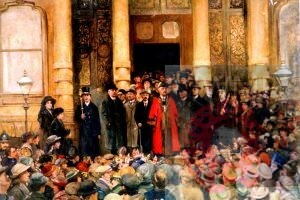 An artists impression of the Mayor, Councillors and Alderman on the Town Hall steps . Tens of thousands of people filled the town centre to hear that the end of the war had been declared. As Town Sergeant, Edmund’s father would have called order to the crowd for the Mayor to make his speech. Edmund’s father James Charles Dennish was a Suffolk Regiment territorial soldier.